The chancellor has labelled the European Union's Brexit negotiators as "the enemy" - a remark he subsequently described as a "poor choice of words". During a television interview, Philip Hammond also called the negotiators "the opponents" and said they should "behave like grown-ups". But he tweeted later: "I was making the point that we are united at home. I regret I used a poor choice of words." Mr Hammond is in Washington for an International Monetary Fund meeting. He has been criticised for saying that the Brexit process has created uncertainty, and this week a former chancellor claimed he was trying to sabotage the talks. During a series of media interviews in Washington, Mr Hammond told Sky News that "passions are high" in the party "but we are all going to the same place". But he added: "The enemy, the opponents, are out there on the other side of the table. Those are the people that we have to negotiate with to get the very best deal for Britain." Despite his regrets, Mr Hammond's comments drew fire from political opponents. Shadow Chancellor John McDonnell said it was an "inept approach from a failing government. Insulting the EU is not the way to protect our economic interests". During his interviews, the chancellor also has described as "bizarre" and "absurd" accusations he is talking down the economy. Mr Hammond said he was a realist and that he wanted to "protect and prepare" the economy for the challenges ahead. The chancellor said: "It is absurd to pretend that the process we are engaged in hasn't created some uncertainty. But the underlying economy remains robust. "I am committed to delivering a Brexit deal that works for Britain," he added. He refused to answer how he would vote if another referendum was held now. "We've had the referendum," he said. "You know how I voted in it." This week, former Conservative Chancellor Nigel Lawson called for Mr Hammond to be sacked, saying he was unhelpful to the Brexit process. Lord Lawson said: "What he [Mr Hammond] is doing is very close to sabotage". Responding to these comments, Mr Hammond said: "Lord Lawson is entitled to his view on this and many other subjects and isn't afraid to express it, but I think he's wrong." The chancellor, who has been accused of being too pessimistic about Brexit, told the Treasury Committee of MPs this week that a "cloud of uncertainty" over the outcome of negotiations was "acting as a dampener" on the economy. 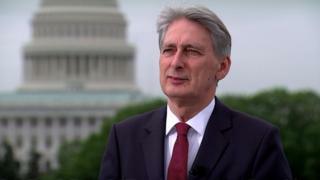 But speaking on Friday, Mr Hammond said he was optimistic about the UK's economic future and was in Washington to promote it. "What I'm doing here in Washington is talking Britain up, talking about Britain's future as a champion of free trade in the global economy, seeking further moves on liberalisation on trade in services which will hugely benefit our economy." He added that Britain had "a very bright future ahead", but added that it was "undoubtedly true" that the process of negotiations had created uncertainty for business. "If you talk to businesses, they would like us to get it done quickly so that they know clearly what our future relationship with the European Union is going to look like." Mr Hammond said the Cabinet was united behind Prime Minister Theresa May's recent speech in Florence setting out her Brexit plans. "We know what our proposal is, we put it on the table effectively. Now we want the European Union to engage with it… challenge us… but let's behave like grown-ups." he said. Mr Hammond said the government would not spend taxpayers' money preparing for a "no-deal" Brexit until the "very last moment". He said he would not take money from budgets for other areas such as health or education just to "send a message" to the EU. One former minister, David Jones, has said billions of pounds should be set aside in November's Budget for a "no deal" scenario. He argued that if this did not happen it would be seen as a "a sign of weakness" by EU leaders, who would think the UK was not serious about leaving the EU without a deal.